The Emirates Centre for Strategic Studies and Research (ECSSR) will commemorate its Silver Jubilee in March, which is an occasion worthy of a brief moment of reflection. The aim, however, should not be to enumerate the accomplishments and successes of the ECSSR during the last 25 years, as they are already apparent to those interested in strategic studies in the Arab region and beyond. Instead, it should be a moment to shed some light on the unique background, framework and culture that has underpinned the centre’s pioneering journey and achievements. We take great pride in these accomplishments, achieved as a direct outcome of the philosophy of success and excellence upon which the ECSSR was established. First and foremost, I would like to stress that the ECSSR is the result of the vision of the wise and informed leadership of the UAE. This leadership, which God Almighty has bestowed upon us, firmly believes in the value of science and knowledge, and in their importance as a foundation for sound future planning which has proven indispensable to the decision-making process in all areas. This firm belief was reaffirmed by the words and actions of Shaikh Zayed Bin Sultan Al Nahyan. He clearly and repeatedly emphasised that science is the basis for the progress of nations, that it is their true wealth and a light that guides the life and future of people. It is this very same belief that the UAE’s wise leadership, represented by President His Highness Shaikh Khalifa Bin Zayed Al Nahyan, His Highness Shaikh Mohammad Bin Rashid Al Maktoum, Vice-President and Prime Minister of the UAE and Ruler of Dubai, and His Highness Shaikh Mohammad Bin Zayed Al Nahyan, Crown Prince of Abu Dhabi and Deputy Supreme Commander of the UAE Armed Forces, have adopted as a method of governance and management, as well as an irreplaceable foundation that guides us toward the future. It is in this nurturing environment, that encourages science, knowledge and scientific research, that the idea of establishing the ECSSR as the first strategic research institution in the UAE came to fruition. From the very beginning, the idea was adopted by Shaikh Mohammad Bin Zayed, who provided his unrelenting support until the centre became a reality under the guidance of Shaikh Zayed in March 1994. The creation of the ECSSR under the chairmanship of Shaikh Mohammad Bin Zayed was the ultimate example of the belief our wise leadership has in the importance of science and research for achieving renaissance, progression and development. This belief has played a fundamental role in ECSSR’s success and development ever since, enhancing its position locally and around the world. I have been honoured to serve as director general of the ECSSR, working directly under the leadership of Shaikh Mohammad Bin Zayed. Although a source of great pride for me, the position has also placed a huge responsibility on my shoulders — working to establish a leading academic centre in the areas of scientific research, community service and decision-making support. Thus, from the very start, a great deal of focus was placed on setting strict scientific standards and guidelines for the work of the ECSSR. These guidelines are based on serious commitment, objectivity and absolute accuracy, while they ensure sound scientific methodology in all ECSSR publications, reports and descriptive or field research. From its inception, the ECSSR has also ensured integrity by applying scientific standards to the realities, issues and phenomena it studies, as well as to all aspects of its research, analysis, information gathering, conclusions and proposals. Within this ethos, the ECSSR has always accorded top priority to the higher interests of the UAE, and to all issues that enhance its position and advance its pioneering development. These rigorous standards and guidelines, which the ECSSR has adopted and committed to from its inception until now, have strengthened its credibility among national decision-making institutions in the UAE, and among academic and research institutions regionally and around the world. This is clearly evidenced by the number of world leaders, from East and West, who have visited the ECSSR to deliver speeches and present their ideas. There is also a long and prestigious list of scientific, academic and research entities from the UAE and further afield that have been keen to form scientific cooperation agreements with the ECSSR in various fields. Moreover, many UAE and Gulf ministries, institutions and entities are eager to collaborate with the ECSSR to realise their goals, trusting in the centre’s credibility and commitment to the highest standards of excellence and quality in scientific research. Since its inception, the ECSSR has been committed to the concepts of change and renewal. It has continuously strived to update its work practices, as well as its research and methodological tools, to stay abreast of ongoing international developments related to its areas of interest. This strategy enables the ECSSR to function in a way that responds to each new stage and fluctuation in society’s development — a fact that has ensured its own continued evolution, while at the same time, consolidated its prestigious research status. This is in stark contrast to similar research centres that have emerged, only to quickly disappear because they failed to evolve.Concepts of renewal, continuous development, innovation and quality are guiding principles that have governed the centre’s performance over the past 25 years. The same principles will continue to do so in the future because I believe that stagnation means extinction, and resistance to change implies backwardness and regression. Therefore the ECSSR will remain committed to adopting a culture of innovation, development, and the continuous quest for new ideas and innovative mechanisms to enable it to realise its goals of serving UAE society and national decision-makers. Our commitment to the quest for new ideas can be seen in the establishment of our Information Technology and Innovation Department in 2018. This new department focuses on the latest advancements in technology, artificial intelligence, and all matters related to the Fourth Industrial Revolution, at the threshold on which the UAE and the whole world stand today. Within the framework of a culture of innovation and continuous development, which the ECSSR has pursued since its inception, the centre has launched several initiatives aimed at stimulating positive discourse on national and Gulf issues. Just some of these include the Storm of Thought Alliance, which the ECSSR introduced to unite the efforts of research centres from Arab countries participating in the Decisive Storm coalition in Yemen. The aim of the alliance is to support decision-makers in each of these countries in a way that serves their national security, and that of the whole region. Another important ECSSR initiative is the Tolerance and Coexistence Programme, which the centre has begun to teach to mosque imams and preachers in the UAE at the start of this year, and coinciding with the national Year of Tolerance. Throughout 2018, the ECSSR devoted its efforts to celebrate the Year of Zayed by organising lectures and cultural events, and by publishing several books honouring the legacy of Shaikh Zayed and his great achievements. Since its early years, the ECSSR has viewed the goal of training specialised national cadres in the field of scientific research as a top priority. It has succeeded over 25 years in graduating several Emirati researchers and specialists who have played an important role, in advancing not only the work of the ECSSR, but also that of the many important national institutions they joined. The training process was also not limited to ECSSR staff given that, over the years, the centre organised hundreds of specialised training and qualification courses for national and foreign cadres alike. The knowledge, research and intellectual achievements accomplished during the last 25 years have made the ECSSR a leader among some of the most active and distinguished research centres both regionally and internationally. In its relatively short lifespan, the ECSSR has organised 73 annual and specialised conferences, 54 scientific symposia, 54 workshops, and around 650 lectures that highlighted various issues of concern for the UAE, the region and the world. Over the years, hundreds of officials, experts and researchers from all over the world have taken part in the centre’s lectures. The ECSSR has also released almost 1,200 publications ranging from original and translated books, and scientific series in both Arabic and English to two academic periodicals, in addition to the thousands of daily news and analytical bulletins issued by the Media Department. Furthermore, the ECSSR has conducted around 400 field studies, in collaboration with numerous ministries and government entities, to gauge trends in public opinion in the UAE on a diverse range of social, economic, political and cultural issues. The centre has prepared thousands of research and policy papers for national decision-makers, in addition to a wide selection of varied achievements that cannot all be listed in this article. Aside from numbers and statistics, the ECSSR is credited with enshrining the concepts of scientific research, strategic analysis and future exploration in the UAE and Arabian Gulf region. It is worth noting that these were concepts not widely used when the ECSSR was first established. The centre is also credited with setting out scientific and methodological guidelines that have later been adopted by many research centres in the region. 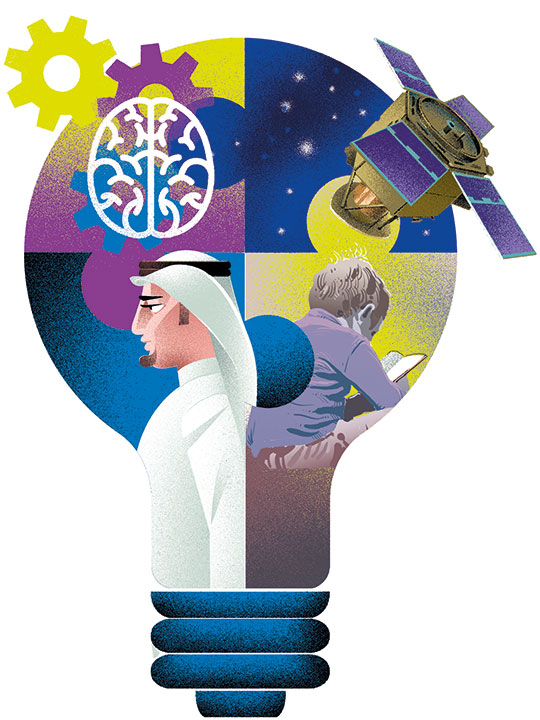 The centre offers the best model, in the Arab world and Gulf region, of connecting the intellectual elite with national decision-makers, as is the case in advanced countries where research institutions play an important role in shaping public policies by proposing options decision-makers can then draw on when drafting policies that serve the national interest. There are many other achievements of which we are truly proud, and they simply would not have been realised without the limitless support and sound guidance of Shaikh Mohammad Bin Zayed. The notion of ‘Delivering the Future’, adopted as a motto by the ECSSR, is not just a slogan for media consumption. It embodies an established fact and an original approach in the ECSSR’s work since its inception. From its early days, the ECSSR and its management have made delivering the future a top priority by investigating important concepts and ideas, anticipating their future trajectories and projecting related scenarios based on sound scientific and methodological approaches. This has enhanced the breadth of perspectives available to national decision-makers, while at the same time, allowing them to craft diverse strategic options when drawing up long-term plans. In observing the progress of the ECSSR, one can notice a clear synergy between the issues it has tackled from its early days — such as diversification of sources of national income in preparation for the post-oil era, development of education, and human development — and the issues that preoccupy the region and the world today. Even now, the ECSSR’s particular interest in technology, artificial intelligence and the Fourth Industrial Revolution stems from the fact that these areas represent forces that are set to shape the future of our region, and our world. Therefore, at a time which coincides with the Centre’s Silver Jubilee anniversary celebrating 25 years of unrivalled achievements, the ECSSR, in its constant quest for distinction and quality, will never be content with the great achievements it has already attained; instead, it will forge ahead with even more vigour, taking its research and intellectual march to the next phase. This is crucial in light of the increasing challenges that face the UAE and the entire region, and considering the mounting importance of knowledge in today’s world. This requires more focus on a wide range of areas of scientific research to enhance the state’s capability to cope with the global knowledge revolution. The ECSSR’s mission aligns perfectly with the higher ambitions of our wise leadership that endeavours to place this promising nation at the forefront of world countries in all fields of development and prosperity.